Big Brother Naija reality TV show finally got its first set of celebrities, in the form of former football stars - Victor Ikpeba and Joseph Yobo. Football icons Joseph Yobo and Victor Ikpeba paid the Housemates a visit. Both Players were accompanied by SuperSport anchor Chisom Mbonu, who acted as the game referee, during a friendly tournament played by the Housemates. The Housemates were divided into two teams wearing green and white t-shirts. While the white team was coached by Joseph Yobo, the blue one was coached by Victor Ikpeba while Anto recorded the scores of the match. 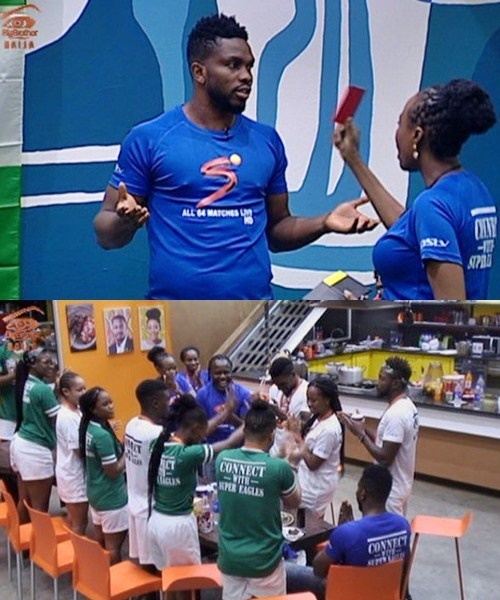 After two matches, with a 9-2 score, the green team (Cee-C, Alex, Rico,Teddy A,Khloe) conceded to defeat to the white team (Tobi, Miracle, Lolu, Nina, Bambam). Tobi got most of the awards after the game, he worn player of the tournament, highest number of assists and best goal of the tournament. Miracle won highest goal scorer, Nina was the best goalkeeper of the tournament after making four fine saves while Joseph Yobo won coach of the tournament. Nigerians reacted to the visit and the way Yobo kept mentioning Nina's name, during their visit. Joseph Yobo applauding Miracle after scoring 4 goals and the highest goal scorer, Nina has proven to be a better goalkeeper than Courtois. “Nina, where’s your spot” ????? ?